Start your spiritual journey to the most revered temple of Tirupati with the arrival at the Chennai Airport/Railway Station where you will be picked up by one of our representatives who help you to drive towards Tirupati by road. It is around 142 Km from Chennai. Upon arrival, pay your respects to Lord Venkateswara which is one of the most famous temples of the country. According to a popular belief, Lord Venkateswara borrowed the money from the divine treasurer Kubera for his wedding expenses and he is still paying back his debt which is why the devotees donate here generously. After darshan check into the pre-booked hotel for dinner and overnight stay. Next day of your Tirupati Temple tour package wake up to the delicious breakfast then proceed to visit the other magnificent temple Govindarajaswami Temple which is an ancient Hindu-Vaishnavite temple and then proceed towards Tiruchanoor to visit the Sri Padmavati Temple, the consort of Lord Venkateswara is situated over here. After darshan proceed towards the Chennai Airport to connect flight to onward destination. Tirupati is one of the holiest places in Hinduism because of the Tirumala Venkateshwara Temple which is situated over here. The Tirumala Venkateshwara Temple is one of the most revered temples in India which is thronged by millions of visitors from all corners of the world make it the second most visited shrine in the world after Vatican. It is the richest temple in the world positioned on the Venkatachala or Venkata Hill in the Chittoor district of the Andhra Pradesh. 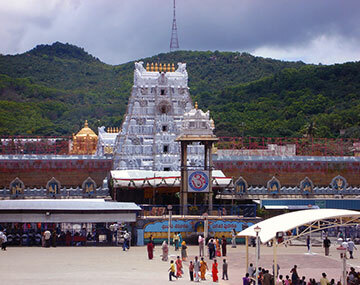 So pack your bags and book your Tirupati tour package with us now. BookOtrip helps you to enjoy the most beautiful places across the world. We help you to get the best suitable itineraries for your holidays so that you enjoy the maximum. Leave your worries about the flight bookings, hotel accommodations, car rentals or travel insurance without any doubt we provide you the best. Rates are subject to change in case of any changes in rate of exchange, Govt. taxes etc. BookOtrip arranged for me the this beautiful trip I believe in God and I love visiting religious place . Going to the temple is the best place you ca go with your family.